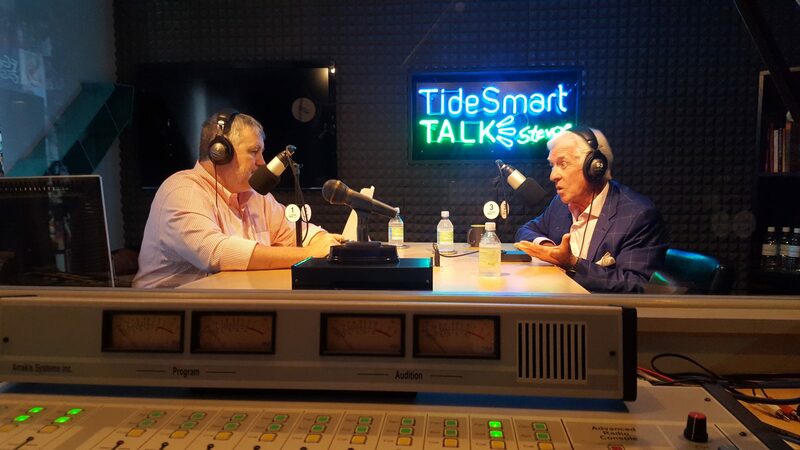 TideSmart Talk recently welcomed back Dana Connors of the Maine State Chamber of Commerce. At this visit, Stevoe and Connors delved deeper into Connors professional history only to find that he’s held just three jobs since graduating from the University of Maine in 1965. He has been at the Maine State Chamber of Commerce for over twenty years now and it certainly seems like he’s still enjoying himself. Host of TideSmart Talk with Stevoe, Steve Woods, welcomed the President of the Maine State Chamber of Commerce, Dana Connors (at right). Dana Connors started his career with an internship. As a Public Management student at the University of Maine, he did not have a lot of money to be able to live and work at an internship in Portland while he was in school, so he took a position in Presque Isle where the cost of living was cheaper. After graduation, the city asked him to return as Assistant City Manager and when the sitting City Manager took another position two years later, the town asked 24-year-old Connors to step into the position. Connors second position came when then-Governor Brennan asked him to be the Commissioner of the Maine Department of Transportation. After a brief, volunteer-based, stint helping Governor Angus King transition into the Blaine House, Connors took the position with the Chamber. He has been there since 1994. The Maine State Chamber of Commerce is “a voice for Maine businesses.” They have three full-time lobbyists on staff. One is dedicated to tax and appropriations issues, one to human resources and economic issues, and a third for environmental, energy, and educational issues. They all work closely with local and regional chambers because those are the people that are closest with the businesses and legislators. Connors guesses that there are approximately 60 chambers around the state, but most are volunteer groups who mainly organize town-wide events. There are 25 to 30 chambers who have paid staff members with clear missions. The Chamber has approximately 5,000 member businesses and according to Connors, 79% of them employ fewer than 25 people. This is an important statistic to consider with the upcoming referendum votes in November. The decisions are difficult because Maine’s economy is so unlike many other states. Stevoe and Connors discussed where the Chamber stands on these issues as well as the pros and cons to voting yes. To hear more, please listen to the interview below. Posted on Wednesday, September 7th, 2016 and filed under Show Recaps.